I recently had the opportunity to meet with the Ambassador of Mexico to the United States, Mr. Carlos Sada, in what was a very private and candid meeting near Source One’s office in Chicago. As the only representative of the procurement function and the only consultant in the room, I found the discussion extremely engaging and surprisingly timely to my company’s nearshoring undertakings. Ambassador Sada pointed out that “numbers don’t lie” and that the US-Mexico relationship encompasses one of the most dynamic and economically significant regions in the world, which is primarily fueled by close ties between businesses - from soft commodity trading to the more recently trending automotive and aerospace industries that not only create hundreds of thousands of jobs in the region but that have become the foundation for many other industries to flourish. 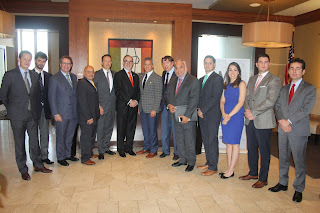 As part of Source One’s Nearshoring offering, we’ve many times reiterated that exploring Mexico as a hub of competitive labor, emerging supply base, and business prospecting is no longer a matter of “if” but of “when” for US companies; and my conversation with the Ambassador reiterated our belief. Through Source One’s network of partners we’ve helped develop synergies between local governments, academic programs and businesses to orchestrate a sustainable environment that fosters opportunity for American and international companies who seek to manufacture better quality products at competitive costs to position themselves not just in the North American market but worldwide. Ambassador Sada’s perspective is both optimistic and cautious. He sees untapped talent and flourishing opportunity for businesses to initiate or expand operations in Mexico that could sustain long term growth for companies on both sides of the border. At the same time, he stressed that collaboration is key to finding competitive business partners and optimizing current relationships. He also indicated that the political climate surrounding the democratic process in the US will continue to play a role post-election but that private businesses will continue to be a main driver for success, and so it is critical for companies on both sides to diligently approach prospects. And I agree, it is not uncommon for Source One’s customers to ask us to define the risk factors in pursuing nearshoring efforts. Many companies are concerned about the true costs of labor, the quality of the products, and stability of the local governments to provide a safe business environment, and when the international trade conditions are challenged, an additional variable is added to the equation of “perception”. Reality however, is sometimes much different, and we’ve been successful in proving to our clients that finding suitable suppliers who can produce innovative and quality products is not only viable, but highly probable. Therefore, it is vital for organizations to work together and manage risk adequately; by pursuing diligent strategic sourcing efforts, risks can be identified and mitigated - and successful business relationships that add value to both economies are created.